A new high school is being planned at the current site of Robeson High School at 6835 S. Normal Blvd. ENGLEWOOD — For students attending school in West Englewood, transferring to a new school nearly 30 blocks east is a risky move, parents say. 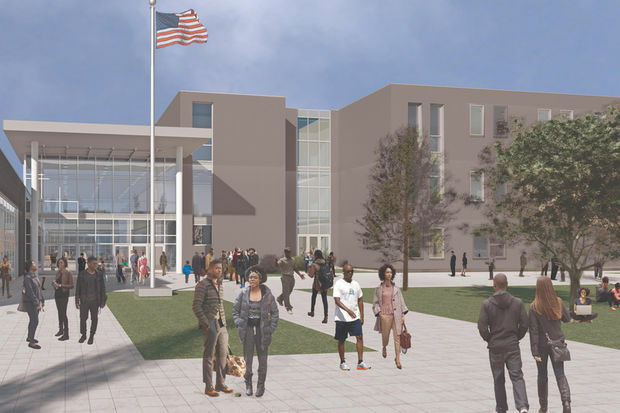 This safety concern came up when Chicago Public Schools and the Englewood Community Action Council shared plans for a new $75 million state-of-the-art high school in Englewood earlier this month. It’s not a new school that’s the issue, parents said, but the proposal to merge four schools into a new building where Paul Robeson High School is at 6835 S. Normal Blvd. The plan calls for the new high school to be built on the site of Robeson High School, and would close three other schools facing plummeting enrollment: TEAM Englewood Community Academy High School, 6201 S. Stewart Ave., which has 143 students; Harper High School, 6520 S. Wood St., which has 160 students; and John Hope Academy, at 5501 S. Lowe Ave., which has 122 students. The Englewood Community Action Council in April said the new school should be built at Robeson, which currently has just 148 students. The council, created by CPS, met with local school councils, parents and aldermen for months and surveyed 1,200 community members. Parents like Bobbie Brown, who chairs Harper High School’s Local School Council, said that sending students to the other side of Englewood is dangerous. Even if students manage to get to and from school safely, there’s still the concern of what will happen once everyone is in the same building, Brown added. But CPS officials said when they announced the new school that they were trying to get students to stay in the neighborhood. According to CPS data, 90 percent of students in Harper's attendance area don't attend the school, up from 52 percent a decade ago. Forty percent of Englewood high school students travel four or more miles to get to school. The school is also significantly underutilized, with an "ideal capacity" of 1,440 students, CPS said in a 2015 report. Its utilization rate is 12 percent, well below the 80 percent CPS standard. Although the Englewood Community Action Council said at a recent news conference that they had met with the local school councils and activist groups, Brown said that wasn't the case with Harper. But Dori Collins, the council's co-chair, said they tried multiple times to meet with the LSC or Parent Advisory Council at Harper, with no success. They first sent a formal letter detailing why they wanted to meet on January 24. "When we called Harper they had no organized Local School Council nor Parent Advisory Council to give us dates [to meet]," she said. "Our chair person went directly to the school to try to retrieve information and left info of our dates, asking for someone to be available so we can even come back." Brown said she and other Harper parents want to see the school remain open, and would prefer CPS pour more resources into existing Englewood schools than spend money building a new one. “The same way they turned Lindblom around, turn Harper around,” Brown said. Lindblom recently had students accepted into Harvard, Stanford and MIT. Harper parent and alumna Regina Brown said it would be devastating for the high school to close. For many of the students in the neighborhood, attending another school just isn’t an option, Brown said. “Some of these kids can't go out of the neighborhood; it’s just not safe,” she said. Her son is angry about the plans. Community advocate Hal Baskin, co-founder of the Englewood Political Task Force and CEO of P.E.A.C.E. (People Educated Against Crime in Englewood), has been working with parents to ensure community members feel they have a voice in the school closure decision. Their action plan is to audit CPS's budget to map out where the money is going, Baskin said. He said after the massive school closings in 2013 that resulted in 50 schools being shuttered, the city doesn't need to see any more closings. CPS is using terms like “underutilization and underenrollment” as a “catalyst to close the schools,” Baskin said. He said that the Englewood Community Action Council doesn’t represent Englewood and that its leadership board is being influenced by CPS. “They are coming into the community to push their agenda, which is a CPS agenda,” he said. Collins denied that the council didn't represent Englewood, noting that it has more than 40 members from multiple groups. Besides being concerned about faculty and staff losing jobs, Baskin said that he’s worried about the students’ safety. He said that schools like Harper and TEAM Englewood have a gang population that are vastly different so merging the schools is dangerous. “You’ll have a Derrion Albert situation,” he said referencing the Fenger High School student who was beaten to death in 2009 when he got caught in a fight between rival groups at the school while he was walking home from school. Baskin said that CPS needs to stop funding charter schools and prioritize taking care of its remaining public schools. He would rather see a new selective-enrollment school or a magnet school in the neighborhood, ideally one that focuses on technology and vocational training. Ald. Toni Foulkes (16th) said that Englewood doesn’t need any more closed schools, because that means more vacant buildings. When she was alderman of the 15th Ward, Foulkes had Harper High School under her jurisdiction. She witnessed the school becoming a turnaround school, and she saw other schools close. To learn about a new plan to merge four schools into one is “deja vu,” she said. CPS needs to listen to the community, she said, adding that before the Englewood Community Action Council meeting in April at Greater St. John AME Church, 6201 S. Throop St., she and other Englewood aldermen met privately with CPS. “Their minds were made up,” she said about the conversations with CPS at that meeting regarding the new school's location. Like many Englewood parents, Foulkes is also concerned about safety. It’s a real issue that can’t be ignored, she said. Charter schools are aggressively recruiting the community’s top students, visiting homes and convincing parents to not send their children to the neighborhood schools, Foulkes said. In turn, those schools lose enrollment and, ultimately, funding. More attention must be placed on the existing schools, she said, because right now there aren't any “feeder schools” directly sending students to places like Harper and TEAM Englewood. The community can win the changes they want to the plan if they unite and demand it, Foulkes said, pointing to Dyett High School’s ultimately successful battle to stay open. In a statement, CPS officials said the district is now planning a series of public meetings to get feedback on the proposal. "CPS proposed the development of a new high school following the Englewood CAC's extensive community engagement process and ultimate recommendation to merge the four current schools into a single state-of-the-art facility," the statement said. "The District has committed to carrying out a series of public information sessions to gather feedback and recommendations from all interested community members, and we look forward to beginning that collaborative process next month."